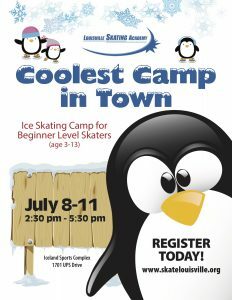 The Louisville Skating Academy’s Coolest Camp in Town is a recreational summer skating program for beginner level ice skaters ages 3 through 13. This camp is appropriate for children who are interested in acquiring fundamental skills for recreational skating, figure skating and/or hockey. No previous skating experience is necessary. Skaters meet daily, Monday through Thursday, for on-ice and off-ice instruction, games and fun.